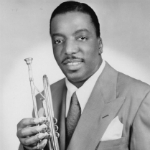 Erskine Hawkins (July 26, 1914 – November 11, 1993) was an American trumpet player and big band leader from Birmingham, Alabama, dubbed “The 20th Century Gabriel”. He is most remembered for composing the jazz standard “Tuxedo Junction” (1939) with saxophonist and arranger Bill Johnson. The song became a popular hit during World War II, rising to No. 7 nationally (version by the Erskine Hawkins Orchestra) and to No. 1 nationally (version by the Glenn Miller Orchestra). During 1936 through 1938, he recorded for Vocalion Records as “Erskine Hawkins and his ‘Bama State Collegians”. In 1938, he signed with RCA Victor Records and began recording on their Bluebird label as, simply, “Erskine Hawkins & His Orchestra”. In the late 1930s Hawkins and his Orchestra were one of the house bands at the Savoy Ballroom. They alternated with the Chick Webb band, and often used Tuxedo Junction as their sign-off song before the next band would take the stage, so that the dancing would continue uninterrupted.